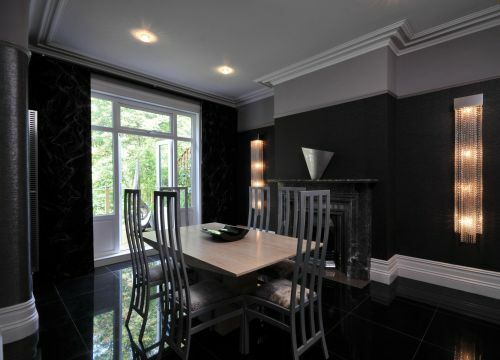 This glamorous dining room has an atmospheric feel about it especially when the long crystal wall lights are the only source of light, reflecting in the polished granite floor. The sliding panels are in exquisite wool felt from Japan decorated with silky threads applied to the face of the fabric in an abstract pattern. The chairs are upholstered in a plush velvet with silver dust on top glistening in the evening mood lighting.